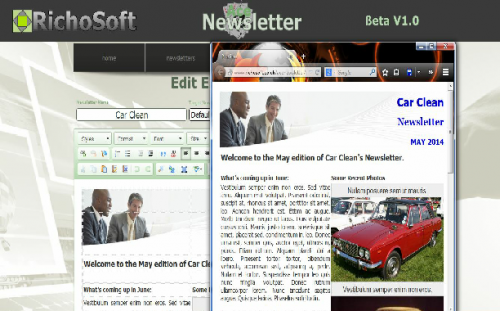 Ultimately easy to install to create, manage and send newsletters from an online system. - Now allows more personalisation with insert Subscriber First and Last Names etc automatically. - Now uses MySQLi extension in PHP for more secure database access. Site WPP- AFiles ONLY version that does NOT require WebPlus but includes the complete system. Additional Files - The pack includes all additional files with instructions on where to install on your site. Backup Embedded Files - You also get backup copies of all files embedded in the system just in case you accidentally remove them. Subscribe Panels - One of the features is the online subscribe panel creator which automatically configures itself to ensure your subscribers are subscribed to the correct newsletters. Un-subscribe Panel- Links are automatically added to each newsletter to allow the user to unsubscribe easily and automatically via a customisable un-subscribe page. Subscribers - Included is a full subscriber management facility. In your pack you will also receive a comprehensive user guide, and all files embedded are provided separately as a backup, ‘just in case’.